A Pre-Assembled Tool Kit is the best place to start, Contact East make the best tool kits. Three separate complete kits should be acquired, each used on different levels of the TSCM inspection. Several foam filled tool cases will be needed to carry small test instruments and fixtures, be sure to buy extra foam sets. The red arrow indicates the ideal case to use (both rugged and secure). Large Foam Filled Transport Cases are required for test equipment, buy the best available, and try to buy all the same type so the cases will interlock. Equipment racks are used to integrate certain pieces of test equipment into a complete system (such as a search receiver system). 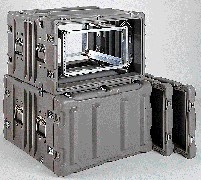 Most lightweight equipment can be mounted in a regular rack (non-shock). However, if the equipment is heavy (over 100lbs) or is going to be shipped then a heavy duty shock mounted rack must be used. Fanout Adapters are used to gain access to the signals on a phone wire. Strippers and skinners provide a fast and easy premeasured way to strip telephone cable wire. A can wrench is "the key" to opening telco phone boxes, Network Interface boxes, and the tool to connect wires on a WE box and terminals. Be sure to obtain a security bit with the can wrench, also the built-in wire stripper will be handy. Wire pics and spudgers are used to move wires and connectors around in a densely wired area, very handy... highly recommended. A quality punch down tool with an assortment of blades is a absolute requirement for any TSCM work. The Dracon 814 punch tool is highly recommended. A set of Dracon 814 punch down blades and case is also a absolute requirement for any TSCM work. Dracon 66, 630A, GTE, 110, 88, 814 and center punch bits are needed as a minimum. (Buy 2 extra 66 and 110 blades, and 3 storage cases).